They are the sorcerer, the witch, the warrior, the scholar, the one of many forms and the one you've lost. In this first book of the Circle Trilogy, we meet the six who have been chosen to lead the war against Lilith, the queen of vampyres, and her army. Hoyt, the sorcerer and Glenna, the witch, find love in all of the chaos of training and fighting. This was a great start to this trilogy. The only problem I had with it was I just didn't feel the strong love connection between Hoyt and Glenna like you do in NR's books. 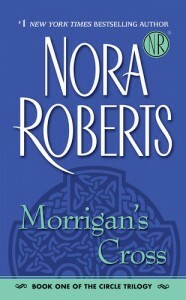 I am hoping the last two books will make up for it, but as with all of Nora's books she has a way of sucking you into the story.